Taxpayers that are self-employed or sole proprietors usually have the option to incorporate their business and operate as a corporation, but when should taxpayers take this step? 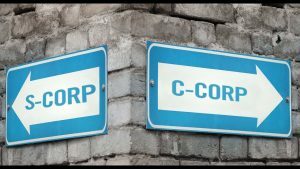 The pros and cons may seem difficult to weigh, and then there is the decision of whether to use an S-corp or C-corp. In this discussion we will focus on deciding if S-corp incorporation is right move. One of the main benefits of moving from a sole proprietorship to a corporation has to do with the self-employment tax. As a sole proprietor, your net earnings from your business are subject to a 15.3% self-employment tax for Medicare, Social Security, etc., which is in addition to the regular income tax. This fact may surprise some people who switch from being a W-2 employee to an independent contractor/sole proprietor because as a W-2 employee the employer pays close to half of that 15.3%. However, as a sole proprietor you are responsible for the full 15.3%. A taxpayer may be able to lessen this burden by incorporating as an S-corp because a taxpayer’s earnings from an S-corp are not subject to self-employment tax. This option does not completely eliminate the self-employment tax, however, because S-corps must pay all officers a “reasonable wage” that is based on the facts and circumstances of the business. Thus, the sole proprietor that incorporates as an S-corp still must pay themselves a “reasonable wage” which will be subject to the 15.3% tax for Medicare, Social Security, etc. The savings then come from the remaining business earnings that are not paid out as a wage because that amount is not subject to self-employment tax. However, the unwary taxpayer may see the potential for tax savings and fall into unforeseen traps. There are extra administrative costs and responsibilities that come with having a corporation that some taxpayers do not wish to have. For example, states generally require a franchise fee each year, regardless of whether the corporation receives income. Extra tax returns, schedules, and information disclosures must be prepared for the corporation, again even if the corporation has no income, and this applies at the federal and state level. The failure to file these forms can generate penalties and interests and cause unwanted headaches. The pros & cons discussed above are only some of the considerations that a taxpayer needs to think about when considering incorporating to an S-corp. At Dallo Law Group we will analyze your specific situation and discuss whether or not incorporating would be best for you. As always, your first consultation with us is free; give us a call at 619-795-8000.